*Update 12/16/2014. This giveaway has ended. The winner was announced here. I received this SkootCase Ride-On-Scooter for the purpose of review. My opinions, as always, are my own. You can count on me to always give an honest opinion about any item I review. Before Ella got a chance to test the SkootCase in the airport, we brought it along on our vacation to Newport, RI (we traveled by car and ferry for this trip). We were lucky enough to get the basement apartment suite at The Jailhouse Inn. I was happy that we brought the SkootCase because Ella was able to scoot along the hallway of the apartment while her baby brother napped. It was a great alternative to just playing on the iPod touch through his entire nap. I flew several trips alone with the kids and didn’t bring the SkootCase since it would be adding to instead of replacing the bags I was already using. 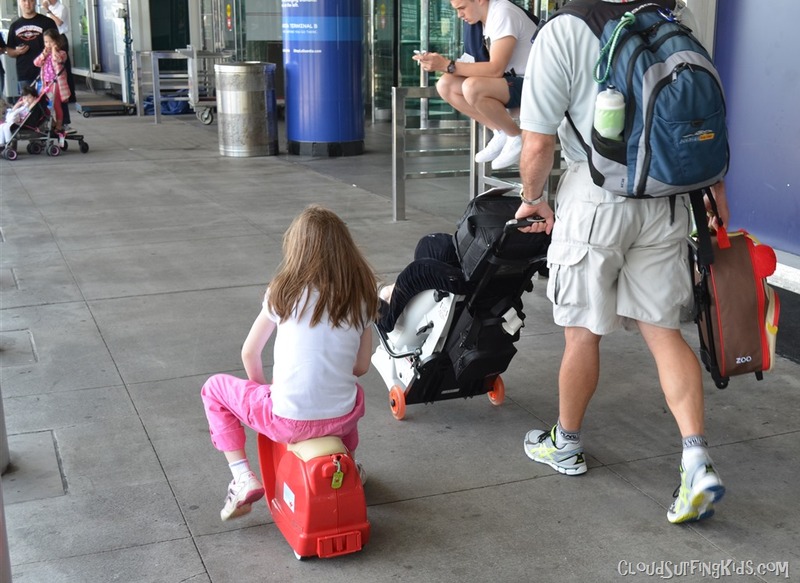 But finally we took a flight with the whole family, Daddy included, and Ella got to test the SkootCase in the airport. At nearly 4 feet tall, Ella looks too big for the SkootCase. but she was actually quite comfortable on the scooter and was able to keep good control of it. I tried John on the SkootCase this month, and at nearly two years old, he is still too young for it. It is recommended for ages 3+. 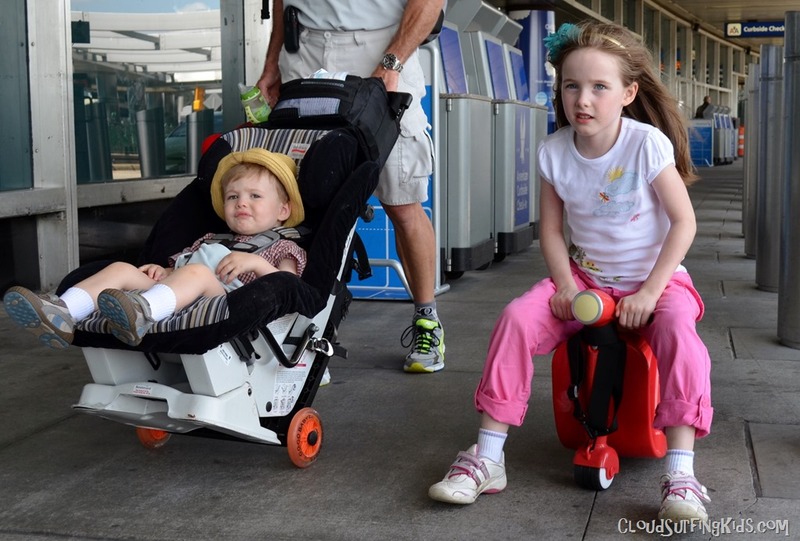 You need the child to be able to steer the SkootCase and unless your toddler is very cooperative, they will be sliding off or turning the handles at inconvenient times and it will take ages for you to get around. 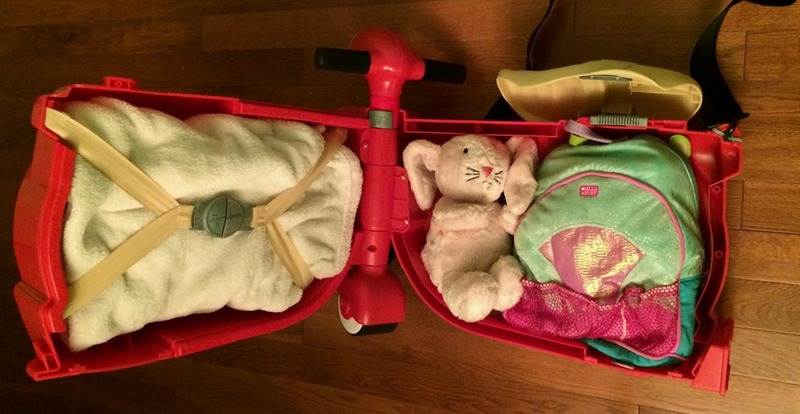 The SkootCase was very sturdy with Ella riding it. There is a tow strap that you could use with smaller children, and this also becomes a carrying strap so it’s easy to carry if your child doesn’t want to ride after all. 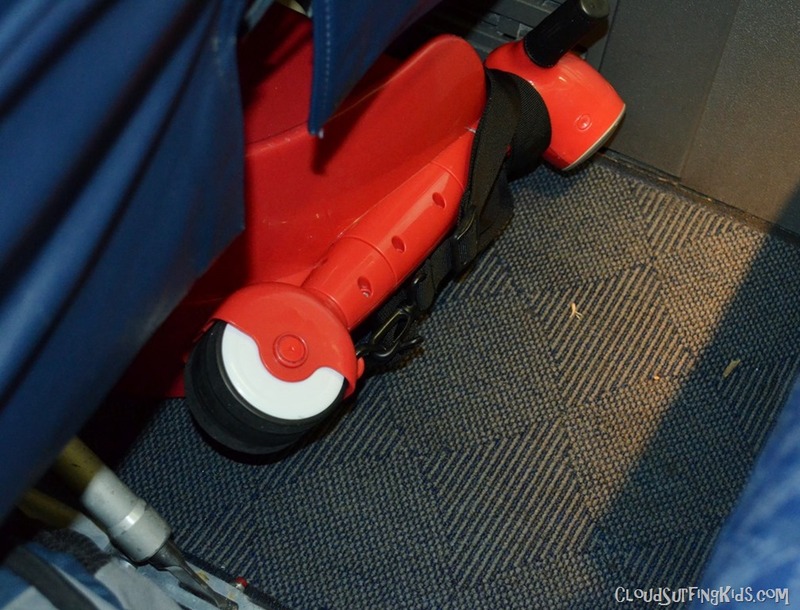 The SkootCase fit easily under our seat on the 737. Each aircraft is different, but I think this would fit under most seats and it would definitely fit in all overhead bins I have seen. The biggest problem we had with the SkootCase was that in order to open it, you have to go through three steps: lift the seat, slide the latch, lift the “license plate”. Although not really difficult, Ella wasn’t interested in figuring it out for herself and just left it to me to open it. On the airplane it would need to be opened across your lap and it extends across two seats. This made it a little bit cumbersome. We solved the accessibility problem by packing a mini backpack full of her toys so that when we were settling into our seats we could quickly remove the backpack and then place the mini backpack and SkootCase together under the seat. Both items easily fit together under the seat on the planes we tested, but the SkootCase also fits easily in overhead bins. Using a backpack alone might be more convenient, but then you don’t have a cool ride as you travel. LOL. Overall we really liked the SkootCase and Ella has enjoyed riding it at home, at Grandma’s house, in hotels, and at airports. 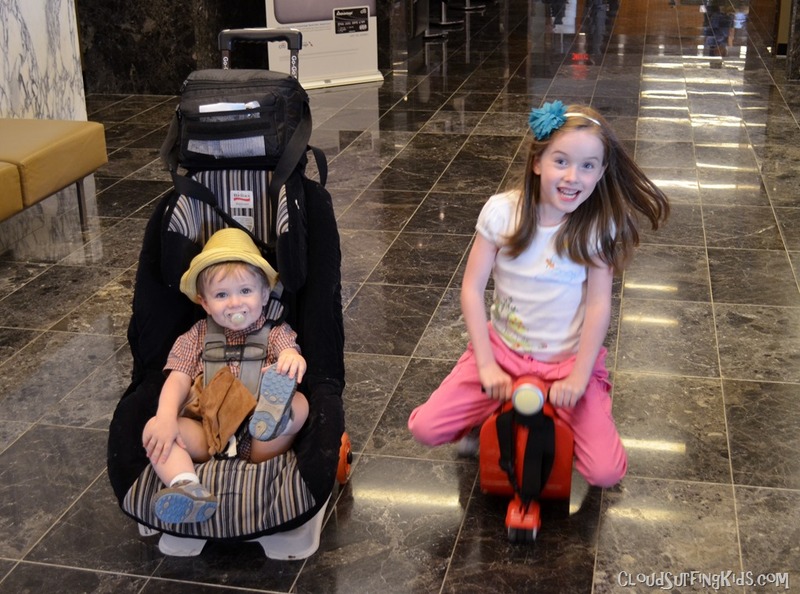 We think it would be really fun for your kids too! Adding fun to your travel with kids, the SkootCase draws lots of admiring attention in the airport and helps emphasize the fun in travel. The SkootCase by Diggin retails at $69.99 and is available in Red, Blue, and Pink. For your convenience I have linked to the Amazon Store where you can purchase a SkootCase. *Disclosure: If you use these links, I may receive a small commission on the product which will go towards running this website. Your cost remains the same. I appreciate your support! To hear more about travel products we enjoy, be sure to follow us on Facebook, Twitter, and Instagram. Is the SkootCase something your kids would enjoy? Tell us what you think about it in the comments below! The giveaway is open to U.S. Residents, ages 18 and up. It ends Monday, December 15, 2014, at midnight. The winner will be notified by email and has 48 hours to respond. The prize will be shipped directly from Diggin Toys. Email addresses will not be used for any purpose other than to notify a winner.